Hyundai has confirmed the pricing and specs for the 2017 Hyundai i30 Tourer. The all-new family estate will start from £17,495 when it goes on sale in July and feature 602 litres of boot space with the rear seats in place, which is 74 litres more than the outgoing car. 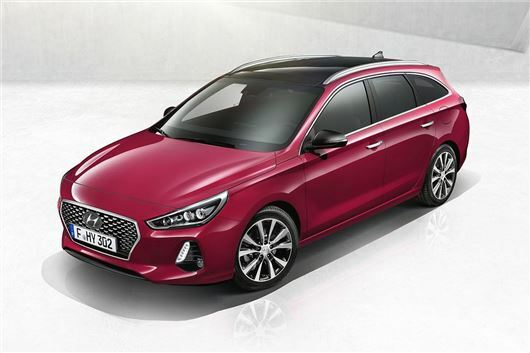 ﻿As with the impressive Hyundai i30 hatch, the Tourer will feature an all-turbocharged engine line-up, with 1.0 and 1.4-litre petrols offered alongside a four-cylinder 1.6 diesel. Advertised economy will peak at 74.3mpg for the 110PS 1.6 CRDi diesel which will also provide the lowest CO2, at 99g/km. A 136PS version of the diesel is also available, but this is limited to a six-speed automatic dual clutch transmission, which cuts claimed economy to 65.7mpg and 112g/km of CO2. The petrol range kicks off with the three-cylinder 1.0 T-GDi with 120PS and an official 57.6mpg. The four-cylinder 1.4 T-GDi will be the most-powerful engine in the i30 Tourer line-up, with 140PS and a 0-62mph time of 9.2 seconds. Like the diesel, a six-speed DCT automatic will be available, but this will reduce claimed economy for the 1.4 petrol from 54.3mpg to 51.4mpg. The 1.0-litre engine will be limited to a six-speed manual only. As well as getting more boot space than before, with a maximum of 1650 litres, the i30 Tourer gets more safety kit, with all featuring lane departure warning, autonomous emergency braking and hill start assist. The i30 Tourer has five trim levels to choose from - S, SE, SE Nav, Premium, Premium SE - but only the three-cylinder petrol will be offered in the S trim. However, base models get plenty of kit, with alloy wheels, LED daytime running lights, DAB radio and Bluetooth. The 1.6 diesels will start in SE trim and feature 16-inch alloy wheels, front fog lights and a five-inch touch touchscreen. Parking sensors, rear view camera and roof rails are also included at no extra cost. Buyers of the 1.4 petrol will have to choose SE Nav or higher, which includes touchscreen navigation, Android Auto and Apple CarPlay. Those wanting more can choose Premium trim, with 17-inch alloy wheels, dual zone climate control, electronic parking brake, privacy glass and heated front seats. The top of the range Tourer Premium SE adds a panoramic sunroof, leather seat facings and a heated steering wheel in addition to the Premium spec.